My boyfriend used to wish he had one of those portable flashing lights for the top of the car, for two situations: when I had my period, and when I was hungry. Though there are limited options for wedding day menstruation (hmm, definitely a potential article there), when it comes to avoiding the "hangry" wedding day, your options are many! 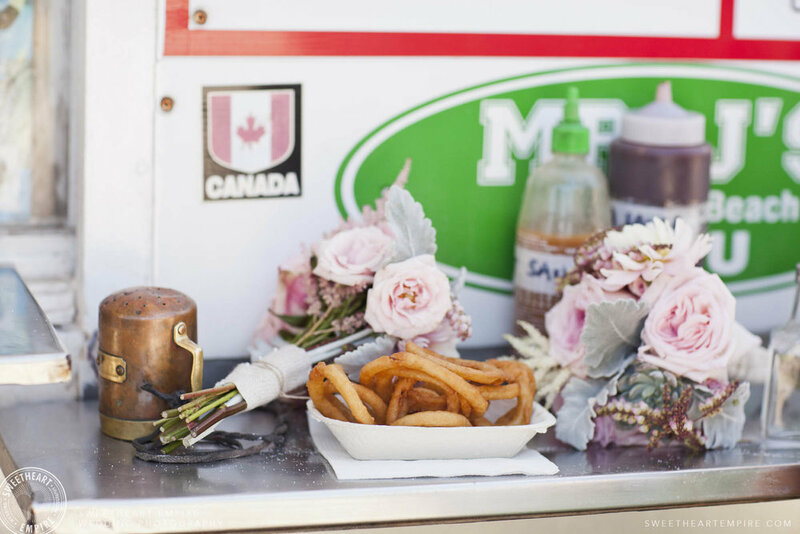 Click here to see how Rosemary kept everyone well-fed at her Camp Manitou Wedding! Even for the chillest couples, the wedding is a big day. When was the last time you invited all your people to come and look and talk to you all at once? It's wedding-day-hangry just waiting to happen! Besides the emotional/spiritual/life milestone taking place, you’ve got a lot to think about and that takes energy. Drink water to keep your energy up! Many brides are afraid they’ll have to pee and avoid drinking water on the wedding day. Don’t do that! Staying hydrated will help you keep your energy up. I know, from the experience of shooting weddings, water gives you a boost and keeps your endurance up so you can smile allllllllllll day long (and still party into the night). Nothing brings on irritability, anxiety, and exhaustion like low blood sugar. 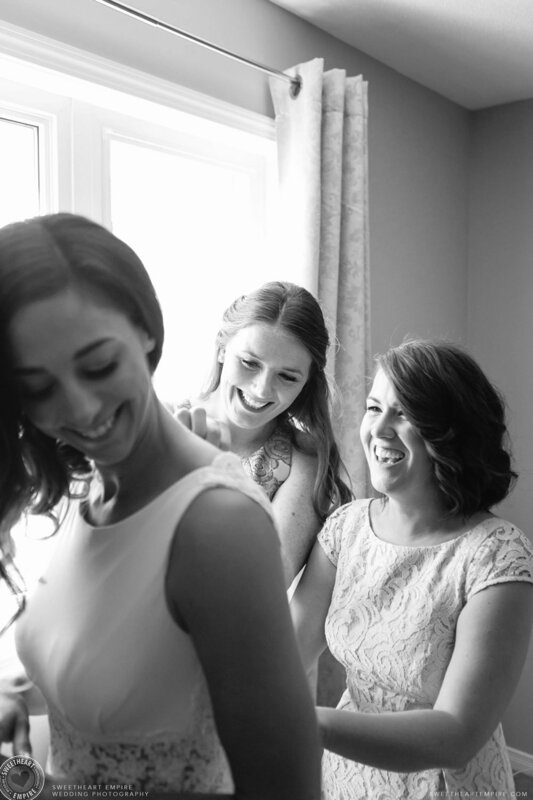 Don’t leave it to chance when it comes to staying in a good mood on your wedding day! Keep snacks on hand for yourself and houseguests, i.e. bridesmaids getting ready at your place. Besides brunch, make sure there are snacks you can force yourself to eat if you get too nervous or stressed out for a full meal. Lipstick touch-up colour from makeup artist, for after she’s left. Small bites of fruit & some sort of bib – no blackberry juice on the wedding dress! Someone you trust, who’s as obsessive as you are, to check that there’s no food in your teeth. None of this “you’re fine you’re fine” when they haven’t even looked! Basically, you need food and drink that takes minimum effort to open, and can be carried with you. And possibly a case of water bottles for your bridal party/family, if you are traveling together in a limo or having a big photo session somewhere away from immediate access to water… Especially in the summer, guys!!! Please! I know plastic water bottles are terrible for the environment, but this is one of those times you might forget your S’well. 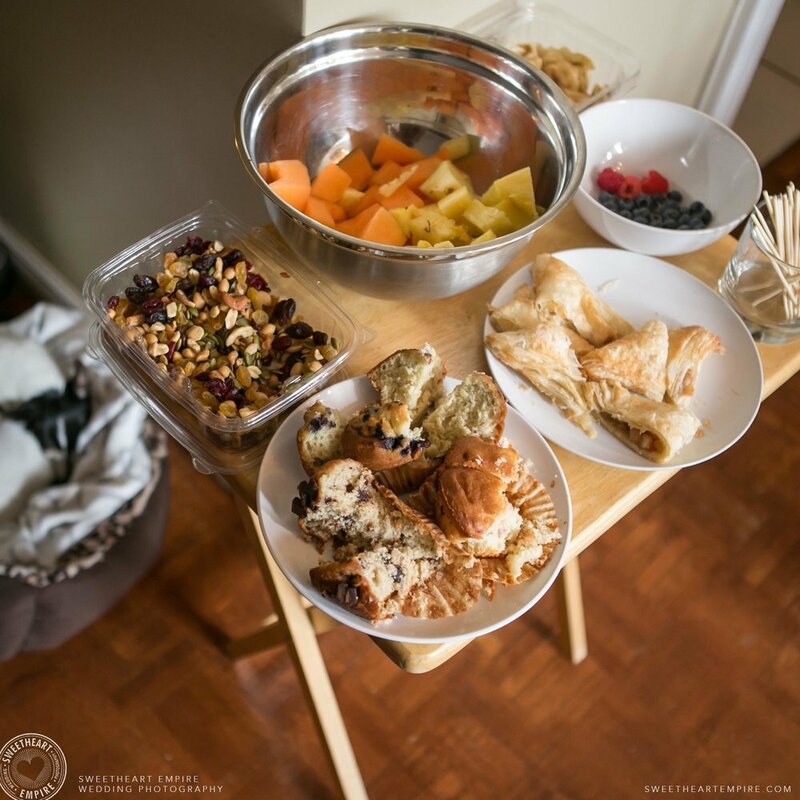 Click here to see how Sahrah & Aaron fed their wedding party, mid-photo session! 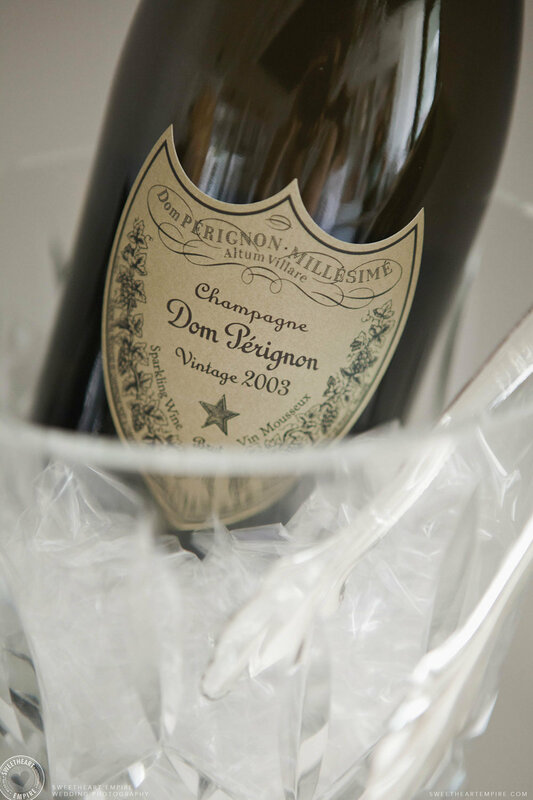 Between morning coffee with your BFFs, and a champagne toast (or three) you need to keep your wits about you. You don’t want to get drunk or shaky, right before you say “I do”. Take care your body with water and snacks, and no portable flashing lights will be needed! Look beautiful, no food in teeth, laughing head off... Check! It’s normal to get in a fight before your engagement photos! Here are some tips for mentally preparing for your engagement session. Life moves so quickly! Here are 3 easy steps for using reflection, stopping time, and getting the most out of your day-to-day moments. With the sad passing of Kate Spade and Anthony Bourdain this week, there have been a lot of posts these few days about depression and suicide. It's hard for people to understand how those who "Have it all" could take their own life. But I totally understand how they could. So I want to share my story of depression and recovery. On gratitude. Tony Robbins says you can't experience anger and gratitude at the same time. Is it true? Find out now! This is an excerpt from my best-selling, breakout newsletter, The Empire Citizen! Sign up for The Empire Citizen, the official newsletter of Sweetheart Empire. Enjoy mindfulness tips, promotional offers, and general joie-de-vivre + nerdiness from me, Kate O'Connor. 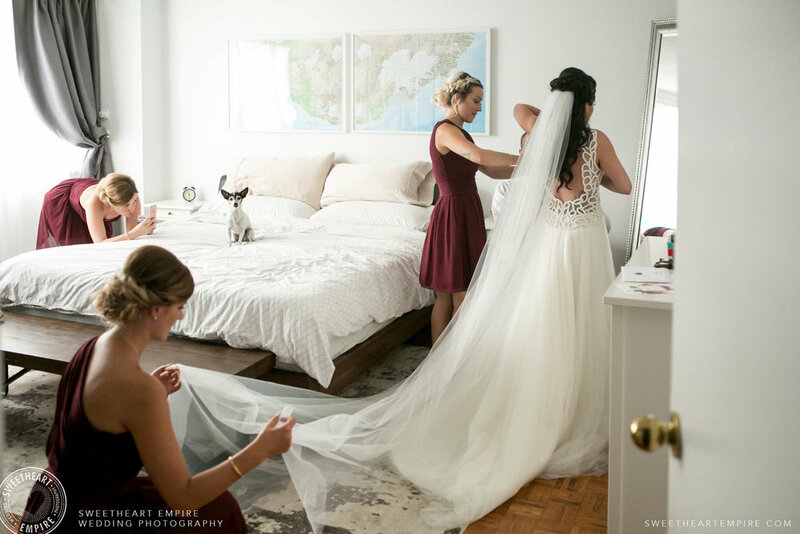 Getting to know your photographer can mean the difference between having authentic documentation of your wedding or ending up with cookie-cutter images just like everyone else's. Come, let me love you. Don't get hangry at your wedding! Two simple tips, plus a wedding day to-do list of what to pack to stay physically and mentally fresh.